Here are a few recommended walks / cycle rides to enjoy straight from the front door of La Ville au Tady (LVT). One of the great things about the cottage is its location set in the beautiful rural Breton countryside, with dozens of minor roads, tracks and footpaths to explore. Most of the routes are short and fairly simple to follow, but the Tregranteur walk is longer and more complex so you should take an IGN walking map from the bookcase to make sure you don't get lost. 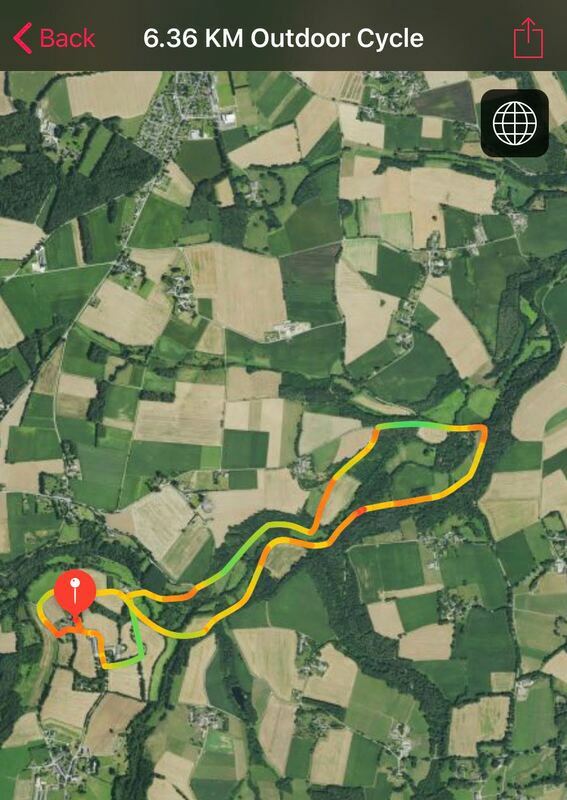 If the walk / cycle has an interactive Google map, you can pan and zoom the map, scroll right to see the expand map symbol. Otherwise a link is provided to view the Google map. From the cottage turn left past the turkey barns. Turn left just past Patrice's house (the local farmer) onto the main road. Patrice's dog, Fram, is very friendly and sometimes woofs at passersby if she is in the mood! ​Walk down the hill to the Moulin. If you want to detour to the bridge over the river Seddon you may spot an Otter in the water. Just before the Moulin de Penroc take the track on the left. You sometimes see deer in the field on the rght. Follow the track. If you look up to the left you will see the end of LVT's garden. Return to LVT via the track. From the cottage turn right and go onto the gravel track. ​Turn left after the farmhouse, go up the track. At the top of the track arrive at Coet Bugat, a small hamlet of a few dozen houses. You can turn left onto the road and return to LVT (short-cut and 1 mile route) or go right in the Village centre onto a gravel track which leads to a small lake on the left, with a hut - this is where the local farmers gather in the evenings to have a drink and a chat. Turn left here and pass the old washing area on the right, this was an communal area to wash clothes before the washing machine was invented! At the road, turn left, and return to Coet Bugat via the cemetry, village hall, and old presbytery. Le Manoir de Mongrenier is on the left. Turn left at Patrice's house (the local farmer) into LVT. Patrice's dog, Fram, is very friendly and sometimes woofs at passersby if she is in the mood! For this cycle it best to use the off-road bikes. Can have a small muddy section after heavy rain. Turn left out of the cottage and follow the road past the turkey barns. Turn left at the junction, down the steep hill. cross the River Seddon, and cycle up hill a short distance. Turn right for the Moulin de Rocsa. You will arrive at the old mill in a few minutes, carry on a gravel track. At the end of the track turn right onto the road, go down the hill and turn right again. ​Pass the old Moulin de Coet Digo on your right. Now cross over the river again and cycle uphill, then take the first gravel track on your right. Follow the track until it meets the road (can be muddy in places after rain). Go straight ahead on the road, following the river back to the Moulin de Penroc. Turn right, then immediate left onto the track which goes around the back of our cottage and returns to LVT. Best as a walk due to the deeply rutted track section. From the cottage turn right and join the gravel track, tuning left, walk up the hill. Before you approach the first house on the track take the first track on the right, through the woods. Exit the woods and turn right on a tarmac minor road, cross over the river. Immediately after the bridge turn right onto a track, follow this though the woods. This section follows a very old trail and is rutted and set below the hight of the surrounding woods. The track will bear left then emerge at a tarmac road. Turn right and go over the river, then take the immediate track on the right. 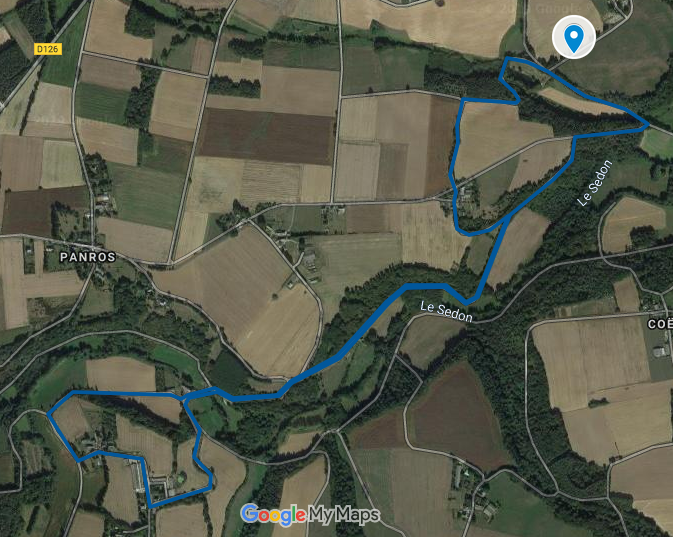 Follow this track until it ends opposite the Moulin de Penroc, turn right over the river bridge, and right again on the track which takes you back to LVT. At the end of the track turn right onto the road, go down the hill and turn left. 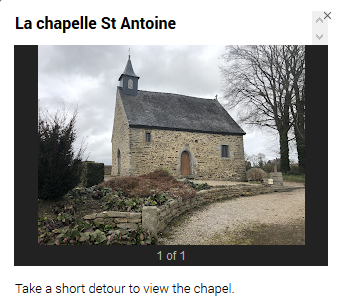 Take the first road on the right to see the small chapel, which will be locked. Return to the road and go straight across onto a track that takes you around a small lake. After the lake follow the track as it bears right. Take the first track on the left, up hill to meet the road at Le Bot. Go straight ahead through Le Bot until the road becomes a track and turn sharp right onto the smae track you were on earlier, down the hill and back past the Moulin de Rocsa. Return back to the Moulin de Penroc and take the track across the road to return to LVT. Out of the cottage turn left and go to the road, turn left again, go down the hill towards Guegon. Go over the River Seddon bridge and take the next track on the right signed Moulin de Rocsa. Pass the Moulin on the right, carry on this track until a sharp left turn up the hill. Enter Le Bot, a small hamlet of 6 houses. Turn left at the major tarmac road. At Bocabois, another small hamlet of houses, turn left, go down the steep hill. Turn right to rejoin the track you were on earlier and return to the Moulin de Penroc. Take the track turning right above the Moulin to return to LVT. A cycle on quiet minor roads, then on a rough track through woods and returning to the cottage on open tracks. Turn left out of the cottage, go to the main road and turn right towards Coet Bugat. Pass through Coet Bugat and continue through Pourmanbon. As you leave Pourmanbon there is a cross roads where you turn right. Follow this high level road with good views until you come to a fork right, take that fork past a farm and house onto a track into the woods. The River is on your left as you go through the woods - take care not to go too fast on this rough track. At the end of the track turn right and then immediate left, take this track through to Coet Bugat. Turn left at the stone cross, passing in front of the church. This track now returns you to La Ville au Tady. 4.3 miles / 30 min cycle / height climbed 400 ft. Turn left out of the cottage and travel to the road, turn right to Coet Bugat. Go past the village hall and cemetery to Pourmabon. As you exit Pourmabon, turn left at the cross roads. Go down the hill and bear left at the botton. Climb up the road to La Ville au Ped, bare right as you exit the small hamlet and then take the next right turn. Pass a gouse on the left, then another on the right. Take the next turn left down a forest track. Go through the woods on this track. Emerge out into Guilleron, and turn left on the road. Go staright ahead at the turn for La Ville Geffray and go down the steep hill (take care!). It's a sharp left turn at the bottom of this hill. Follow this road to the Moulin de Penroc and go across the next road to join the track back to La Ville au Tady. Click on the map to pan/zoom. Turn right out of the cottage and then go left on the track up the hill to Coet Bugat. At Coet Bugat centre bare right and the road becomes a gravel track. At the end of the track turn left at the small lake and fishing hut. At the road turn right into Pourmabon. Go between the first two houses, when the road forks follow the track to the right. Turn right at the end of the track, then immediate left on a tarmac road, pass a house on your left. Follow the road into the centre of Tregranteur. Turn left into the village and pass the church on your right. The grand gates of the chateau are shortly on the left. The chateau was built in 1750 and is privately owned by a family who reside in Paris for most of the year, but hold an annual Easter event in the grounds. Take the next road turn on the left and follow this into Guilleron. Turn right through the farm road that carries on into the woods. 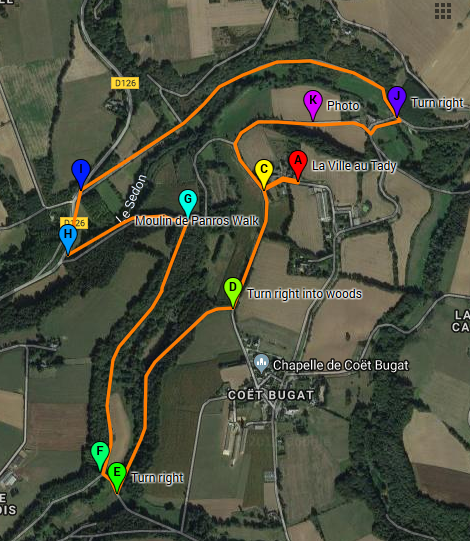 Follow the map route through the woods and emerge at Moulin de Coet Digo, go left on the tramac road. Turn left onto the track and follow it to the Moulin de Rocsa. Carry on to the road, turn left, cross the bridge and pass the Moulin de Penroc on your right. Take the first track right that leads you back to LVT. If you prefer, you can create your own route using the network of minor roads, tracks and paths in the area. 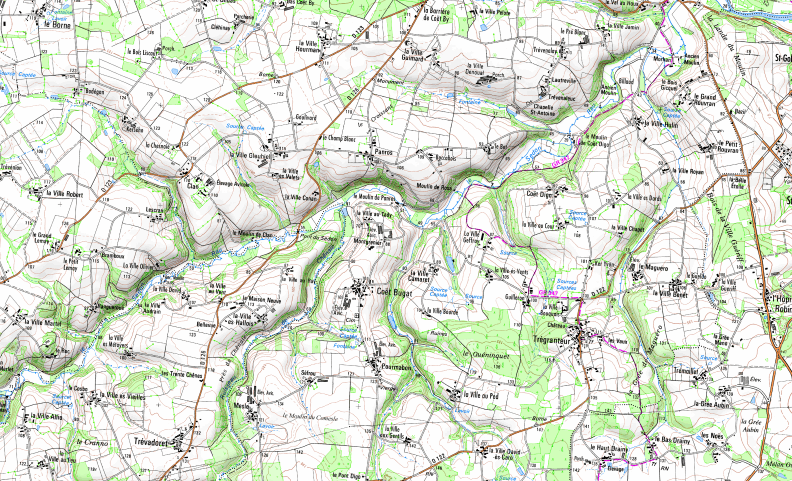 We provide the local IGN walking map of the area at the cottage for you to explore. The possibilities are vast, as you will see from the copy of the map below.